TWO first half strikes were enough for Maybole to lift the British Energy Ayrshire cup as the South Ayrshire side revelled on the Premier League surface. Maybole did not look out of place on the big stage playing silky soccer and using the width of the pitch to great effect. They took the lead in 15 minutes when a Gary Toye cross was met at the back post by Matt Mullen. Mullen then headed back across goal wrong-footing the West Kilbride keeper to put 'Bole in front. And they doubled their advantage on the half hour after a superb through ball from Michael McCann found Alan Brownlee in the clear. Striker Brownlee raced in on goal and coolly fired low into then net from just inside the box. It was to be a great day all round for Brownlee who was later called up to the Scotland squad for the Ireland clash. After the break Maybole continued to do all the pressing despite being in command. West Kilbride finally threatened the 'Bole goalmouth when they hit the cross bar after a scramble in the box. After the scare, Maybole re-gained their composure and took control of the final, creating several more chances. However, despite Mullen, McCann and Brownlee all spurning chances, the South Ayrshire men never looked like losing. After Maybole were presented with the cup, star striker Brownlee, in a magnificent gesture, gave his winner's medal to ?. The young wheelchair-bound supporter has followed 'Bole for years and was over-joyed with Brownlee's gift. 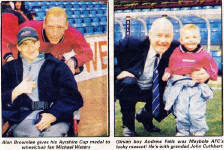 ( Ayrshire Post 5th April 2002).